This example shows T-SIM used as a web predicting tools. 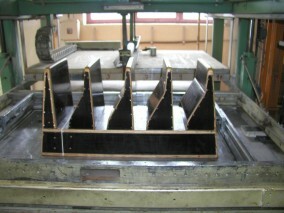 The part, a large transportation tray, is produced by plug assisted thermoforming. The transportation tray size is 500 x 1000 x 400 mm (width x length x height). The initial sheet thickness was 8 mm. The task was to analyze any possible problematic areas where webbing could appear. The part (tray) has one plane of symmetry. However, in this case the deformation of the whole sheet was simulated by the application. Obviously, the needed number of sheet elements was quite high (80,000) in order to obtain good enough simulation results. Supposing that just one half of the sheet is simulated, the number of elements would be created about 40,000. Tools were imported via T-SIM STL importer. A sheet was created having the size and thickness as in the real production. A project was created and its simulation time was about 1 hour and 20 minutes. Below is T-SIM window with the final simulation record. It is obvious that T-SIM prediction is almost identical with the real results. This case study shows how T-SIM can be used as a web predicting tool. This means that any tool (mold or plug) can be tested on PC instead of wasting material and time in the real production when designing the tool shape. The comparison of simulated and experimental results proves that T-SIM is capable to give good enough predictions even in cases of complicated shapes produced using plug assisted forming, including prediction of web formation. This example is a courtesy of Vyvaplast, Czech Republic.